Are you trying to grow your email list? Have you been noticing how some people are growing their email list like gangbusters? Have you been asking yourself "What on earth are they doing differently than me?" Maybe you are just starting your email list and you are DESPERATE to figure out how to give away a download in exchange for an email address. Have you heard of content upgrades or lead magnets? Ok if you don't have any clue what I am talking about, don't fret. In this blog post you are going to learn exactly what a lead magnet is and how it can help you grow your mailing list. Then you are going to learn step-by-step exactly how to create a lead magnet and how to give it away. Grab a drink. Saddle up. Let's Get Down To It!!!! What a lead magnet (content upgrade) is and what kind is most effective. You will also learn how to create a lead magnet for free. If you are in a hurry, feel free to skip ahead to any part of the post by clicking on a link in the quick navigation below. What do you need to create a content upgrade? Part One: Do you have the tools for your content upgrade? A Quick and easy content upgrade that you can create for free. A lead magnet, often called a content upgrade, is something that you offer a blog reader for FREE in exchange for them signing up for your email newsletter. In essence you are bribing your reader! I mean, you are giving your reader an incentive to sign up for your newsletter. If you are having trouble thinking about how creating a FREE giveaway would work, think about the last time that you went to a conference or event. Have you ever walked up to a booth and someone handed you a FREE Gift? Just recently we did the Santa Run in Plano, TX. It was such a blast. Imagine thousands of people dressed in Santa Suits either doing a power walk or a 5k. It was an amazing sight. At the even,t Care Now had a booth. They were giving away bags that had their logo all over it and water bottles with their logo. Inside of the water bottle was bandaids and chapstick, with even more logos. Just recently, I had a few different friends that were sick. Do you know what I recommended that they do? It was not visit a doctor's office. Nope, I said "You should go to Care Now." See they gave me something useful and I remembered them. If you create a content upgrade and it is useful, your readers will thank you for it by signing up for your email newsletter. Before we get too deep into the specific steps, let's cover the tools. As with every aspect of digital life you will need a few things to create your lead magnet. There are countless tools these days that you can use to create and deliver your content upgrade. When I first went on this journey I did a lot of research. Without question, I believe that Thrive Leads and Thrive Content Builder are the best tools on the market today. I am such a fan that I created a website that focuses on tutorials for their products. You can check it out here: http://blogbuildtips.com/. Also, if you are interested here is a wonderful comparison of Thrive Landing Pages vs LeadPages. The first 2,500 subscribers does not cost you. This means that you can start growing your mailing list for free. Plus if you want to start automation, you can do it at a reasonable price with Mail Chimp: http://mailchimp.com/features/automation/. So with that said these are the tools that will be used in this tutorial. Bonus Item: I use Thrive Content Builder to create my landing pages. If you do not currently have a self hosted WordPress Blog, check out this 13 part video tutorials series on how to get going on that: How to start a blog today. The first step in giving away a lead magnet is creating your document. We will cover a few tips on how to quickly create your first content upgrade and even discuss what it should be. We will cover this in more detail below but as a preview, you will need a pdf document to give away to your subscribers. This is a free tool that is extremely simple to use. You will see the step-by-step tutorial video below. This is an optional step in the process but it can be quite helpful in making sure that your reader converts to a subscriber. It explains to them that they will need to confirm their email address and that they will receive a link for their free content upgrade. When your new subscribers confirms their email address they will be automatically redirected to a download page. This page will house the link that you created using download monitor. This will be the email list that your new subscriber will be assigned to. Also, in this step I will show you how to setup the redirect to your download page. In this step you will learn how to create the email signup box that you will embed into your new blog post. What are the typical types of content upgrades and/or lead magnets? 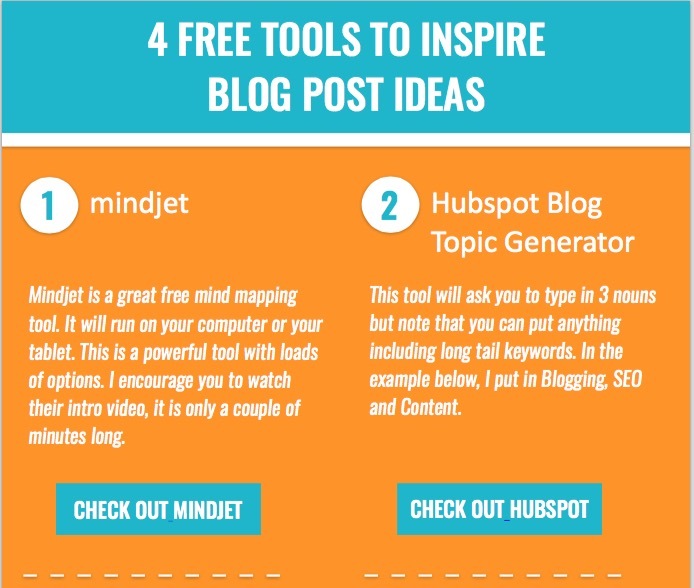 Is your mind reeling with wonderful ideas after reading this list? If so that is great but STOP for a moment. There is an important factor to consider when creating your content upgrade. What kind of content upgrades convert best? You first instinct may be to create a really fab ebook or video course but that is not the recommended path. It seems like a BIG give-away would be awesome but it is actually overwhelming. What do people want then? People want a quick win. They want something that will help them right now. They want something that will add value to them right now. People do not want to feel like they have one more book to read. They do not want 14 hours of video. They want 5 pages to read right now (with lots of white space). Readers want a 5 minute video that answers a hyper specific question. Readers want a specific answer to a specific question. This means that your content upgrades need to be specific. Generic content upgrades are boring. Hyper specific content upgrades are exciting. Have you written a blog post that is chock full of value. One that if a reader had a print-out of it, their world would be better? If that is the case then you create a pdf of the blog post and give it away for free. It could be your lead magnet. A. Do you want to remove the image from the pdf? I tend to remove any images that are not absolutely necessary, such as the featured image. If my reader wants to print out this document, I don't want them wasting ink. B. Do you want to delete any content? Do not click delete on your keyboard. Once you are done, go ahead and click on 'PDF' and your new content upgrade will be generated. Note: While your pdf is being created you will be show some ads. Congratulations! You just created your very own content upgrade. Hubspot provides some super nice looking ebook templates for free. Go here and download your free templates. Note: These templates are created in Power Point. You can run .ppt files on a Mac or a PC. However, you will need Power Point installed on your machine. Hubspot provides you with a nice set of instructions on how to best use their documents. I have created several content upgrades using these documents myself. It takes more time to create a guide but it is well worth it. Guides convert really well and I highly recommend them. Checklists are great. People love them. I love them. You probably love them too. They are easy to create and they don't have to be too fancy. I just created you a super simple Google Doc Template that looks nice. You can use it by clicking here: Checklist Template. Note: You will need a Google account to use this document. To add a row to an existing table just hit the tab key on your keyboard (when your cursor is at the end of a row). To delete a row, right click on the row and click on delete row. In the video below, I walk you through step-by-step creating your download link for your lead magnet. For your reference, the steps are also below. Just follow along with the video. The download page is the page where your email provider will forward a new subscriber so that they can get their new lead magnet. This is a purely optional step in the process but I believe that it adds some real value. This page tells the subscriber that they will receive an email asking them to confirm their email subscription. If you are using a 2-Step Opt-In and the subscriber does not click on that confirmation link, they are not subscribed to your newsletter. Therefore, getting them to click on that link is critical. I created this page using Thrive Content Builder, my preferred landing page software. However, if you do not want to purchase this software you could put these three steps in a normal WordPress page. Step 1: Go to Your Email Inbox. (Note: Make sure that you go to the email that you used to sign up for the newsletter). Step 3: Click on the confirmation link. (Clicking on this link tells the MailChimp that you do want to receive emails from me). In the video below, you will see how to create your Thank You page quickly and easily with TCB. Now that you have created a lead magnet, you have created a thank you page and a download page, it is time to setup your MailChimp list. There is a quick and easy method of redirecting your email subscribers to the download page when using MailChimp. Once you have created your MailChimp list, you will need to find and copy your MailChimp API key. You will need this for the next step below. Note: If you don't have an existing API key then click on 'Create A Key' and walk thru the prompted steps to create your MailChimp API Key. The final step with MailChimp is connect it to your Thrive Leads account inside of your WordPress dashboard. Whew, you are almost done. Now, it is time for you to create your email opt-in form. You are going to learn how to create one similar to​ the one below. You can print this reference guide and post it on your wall or keep on your computer and use the clickable links as you plan your blog. The most challenging part of create your email opt-in form is knowing what put in for your call to action. Writing CTA's is something that I still find extremely challenging. ​Keeping it simple means keeping your form intuitive. Make it easy to understand what value subscribers will receive for signing up, and any other relevant information like how often they will hear from your company. Do not try and be a fancy wordsmith. Just speak plainly and tell your reader what they will gain if they sign up for your newsletter. There is no question that creating a content upgrade is time consuming. This is why it is valuable for your readers. When you take the time, to create a take-away document that provides your reader with a quick win, they will remember it. When you are trying to decide if you want to provide a lead magnet for your readers, consider the fact that it is an investment in your reader. If you have any questions about the steps on how to do this, please do not hesitate to ask me in the comments below.